‘In no time at all I reached the top of the first waterfall. There used to be a track cut down the north side of the valley that went down to the other 4 waterfalls just below and then on to Yarra Falls further down the valley. From the gradient and the thickness of the bush I decided that I was not going to try to find any trace of it and would instead aim for the next ridge and follow that down to the Yarra River. I stopped here for lunch and to take a few photographs of the first fall. The forest had been reasonably open until this point. It then changed and became hopelessly tangled. The steep slope combined with the almost impenetrable undergrowth and countless slippery branches lying on the ground made the going very hard. I eventually reached the top of the ridge and was disheartened to find that it didn’t get any clearer. After struggling through another 100m or so of thick undergrowth it all suddenly disappeared. The forest opened up completely with only leaves and logs on the ground. And what logs they were. It’s not often that I have to climb over a log but the trees here had been saved from logging and the fallen trees were huge. I found no sign of any blazed trees marking the old trail but occasionally I thought I could see a levelled overgrown track about 1.5m wide. 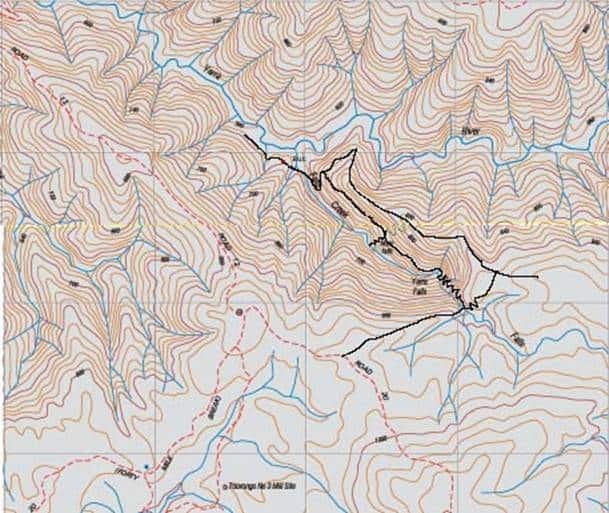 I made fairly quick time down the ridge which became steeper and steeper towards the end and as suddenly as the forest had opened up it became a dense tangle once more. The last 100m down the ridge was soul destroying. It required so much effort just to take one step that at one stage I just turned around and pushed through the undergrowth with my back pack. The undergrowth was so thick that I ended up walking on bent, intertwined branches and would occasionally find myself about a metre above the ground. I eventually made it down to the beautiful junction of Falls Creek and the Yarra River, a broad fern gully, at sunset. I set up camp on a sand bank at the junction of the two streams and hoped that it wouldn’t rain too much that night. The walk up Falls reek turned out to be a relatively simple one. The entire walk was in amongst a wonderful fern gully. I had to keep swapping from one side to the other as the bank became to steep but there was always somewhere to walk, even if it was on top of a 1.5m wide tree trunk. The only really annoying part was the leeches, but considering the length of the walk I didn’t fair that badly. Eventually I reached it, ‘the black hole’ as it was sometimes known. The sides of the valley are so steep that from above, you could hear the waterfall but not see it. The falls were a little shorter than I expected and the gorge into which it fell a little wider. This was certainly not, though, a black hole. After emerging from the darkness of the tree ferns this was quite the opposite and I spent most of my time waiting for the sun to go behind a cloud. The original photograph that I had seen of these falls was taken from a small ledge about 5m higher than the viewpoint for the photographs above. A tree fern obscured the view from this ledge so I didn’t bother attempting the tricky climb to it. I stayed there for lunch before heading back down along the creek. While I made ‘good’ progress it must have been slower than I thought as I returned to the tent in fading light. After evicting the leeches from my tent I settled down for a good nights sleep in preparation for the walk back through those two stretches of thick undergrowth and a few unexpected finds. A few light showers overnight had made everything dripping with water but it wasn’t really very cold. I decided against putting my waterproof pants on as they would probably make me too hot. This turned out to be a good move. After packing up my campsite I tried to find a break through the undergrowth for my return journey. There were none. It was going to be a couple of hours of take one step, part the branches, put the camera bag on the ground ahead, part more branches, take one small step, part the branches….. over and over. When I reached the clearer forest again I found a piece of green electrical tape on a small tree. It was on what appeared to be another remnant of the old track, a level section cut across the slope about 1.5m wide. The track went left across the ridge and another piece of tape made me guess that someone had tried to retrace the old track. That’s all very nice but I just wanted to go home and I headed straight up the ridge. 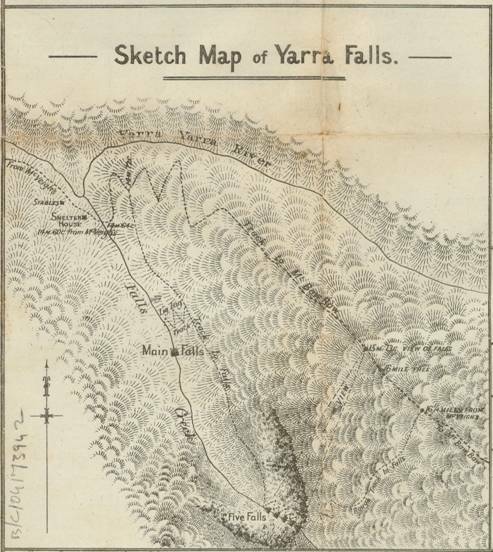 The old tourist map of Yarra Falls marks a lookout where you can see the upper five falls. I had looked for it briefly on the way down without success but found it on the way up. I could only hear them at first but found the spot after wandering down the side of the ridge a little. And then it was back into the thick undergrowth. By now I had developed a technique for getting through the bushes, and knew which trees to avoid. It was still tough going and I reached Falls Creek again slightly above the first fall. This part of the creek was typical of the difference between this forest and any other that I had walked through. Normal fire prevention management reduces the amount of dead timber and leaf litter on the ground. Here, in the absence of such practices there were logs everywhere… not just across the creek but everywhere down the slope. This made walking quite tricky with the occasional slide down a slippery log to get the adrenaline going.